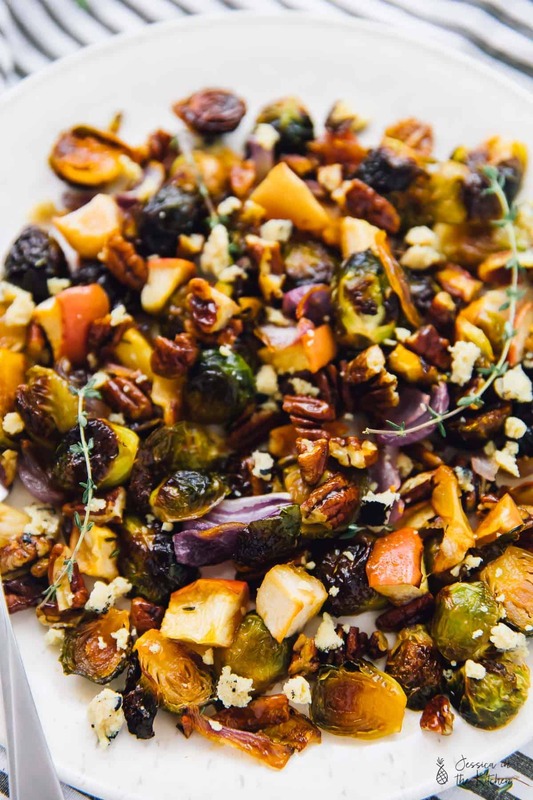 These Maple Roasted Brussels Sprouts with Apples and Pecans is perfect for any Thanksgiving or holiday side dish! 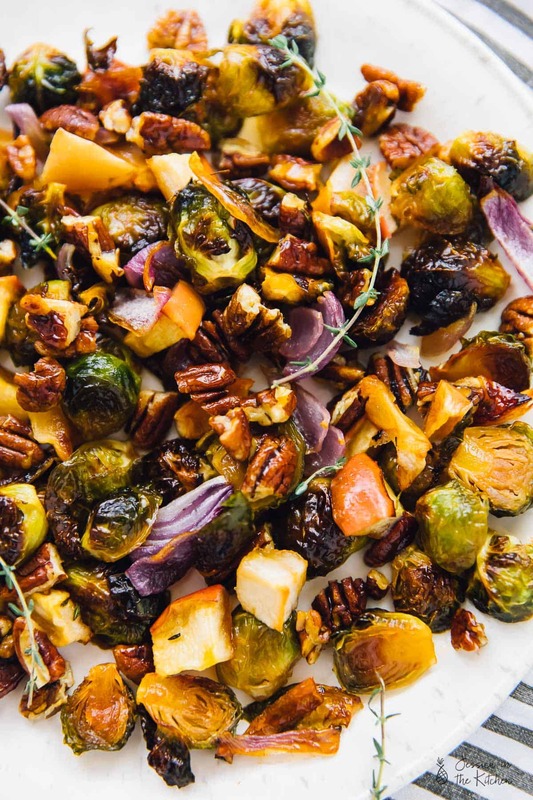 The roasting brings out the amazing flavour of caramelised brussels sprouts, onions and apples and crispy pecans. These Maple Roasted Brussels Sprouts might look familiar if you’ve been around for quite a long time. 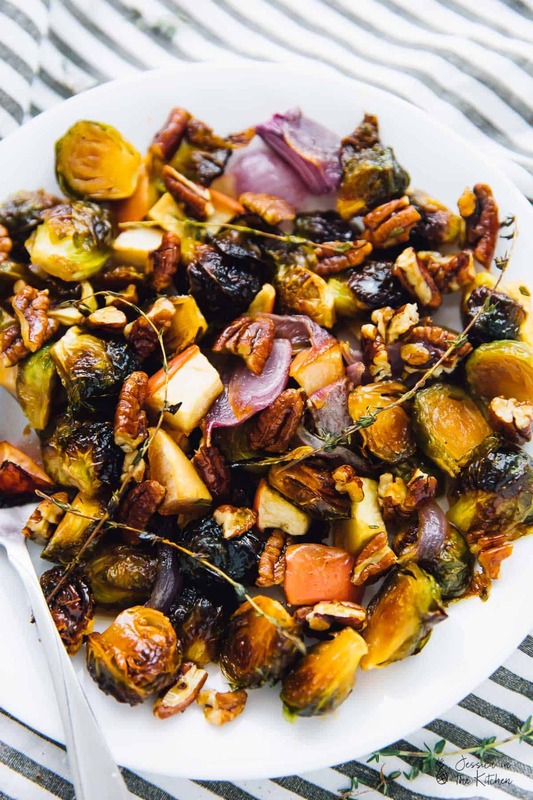 This recipe is a remake of maple roasted Brussels sprouts, onions and apples that I made way back when like two months after Jessica in the Kitchen was born. Sometimes I look back, and there are some amazing recipes that I made four years ago, that somehow lost their momentum. These Maple Roasted Brussels Sprouts were an example of one of them. I wanted to bring back this recipe and make it way better. 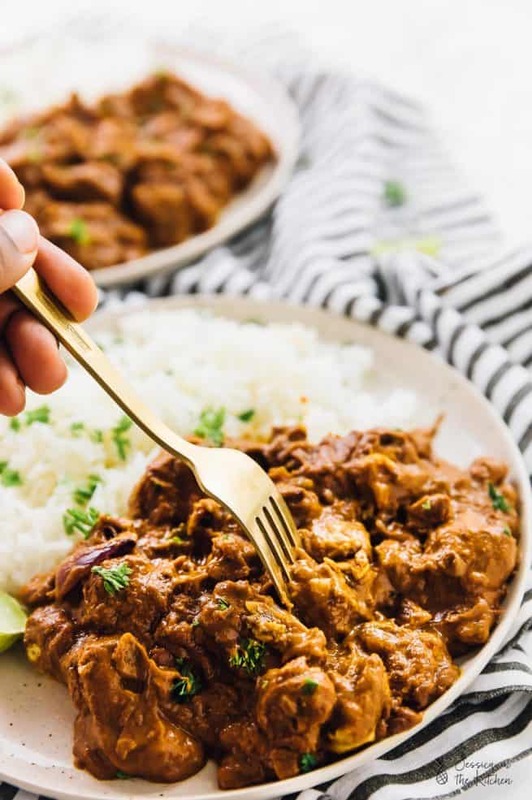 Over the years, my tastebuds have definitely gotten “better” (if that’s a thing), and it’s allowed me to bring what was the best in an old recipe right to surface, while making the accompanying flavours even better. ANYWAY. All of that to say that these are even better than the first set, if you remember those. If you’re someone who loves brussels sprouts, trust me, these are for you. If you consider yourself a “brussels sprouts hater” well boy are you in for a treat. These could convert anyone. Let’s start with the basics. I love Brussels sprouts. I’ve made them raw in a salad topped with a sweet orange vinaigrette that Gavin and I pretty much devoured by itself. I’ve also had them pan roasted (my favourite way). Today, we are roasted the in the oven. The combination of the heat, sugar and seasonings allows the Brussels Sprouts to not only crisp up on the outside, but become soft and caramelised at the same time. They taste sweet, soft, crunchy all in one bite. Oh, and if you’re wondering – it’s absolutely enchanting. Not that I got to experience it this time – Gavin basically ate ALL of this. Yah, thanks. Added in with the brussels sprouts in this dish are apples, red onions and thyme. The apples and onions also become soft and caramelised, and pair deliciously. THEN. THE KILLER. Okay, that was super dramatic. But those caramelised pecans. I was pretty extra and basically drizzled maple syrup over pecans, in a pan, for like two minutes over heat. It crisps them out, slightly caramelises them and tastes perfect. Or, you could just toast them by themselves in a pan. But that crunch is NEEDED and delightful. Here’s the full recipe if you need it. ALSO extra? I added in a vegan gouda cheese. OKAY – now we are talking Thanksgiving side dish. 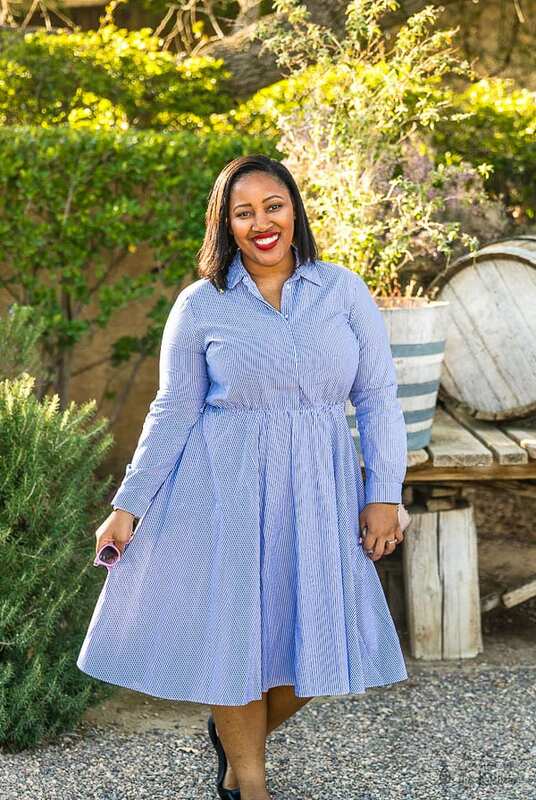 Your guests will be wowed. It’s definitely not necessary but I know you guys are always talking about how to “up the wow factor” on dishes. Usually when I make them, I add a little something something to it but don’t include it in the recipe because I’m not trying to make you buy a million ingredients. I really do recommend it here. It reminds me of those blue cheese salads I used to have before going vegan. But I really do recommend it here. Either way, it’s an amazing side dish. Cut the brussels sprouts in half. 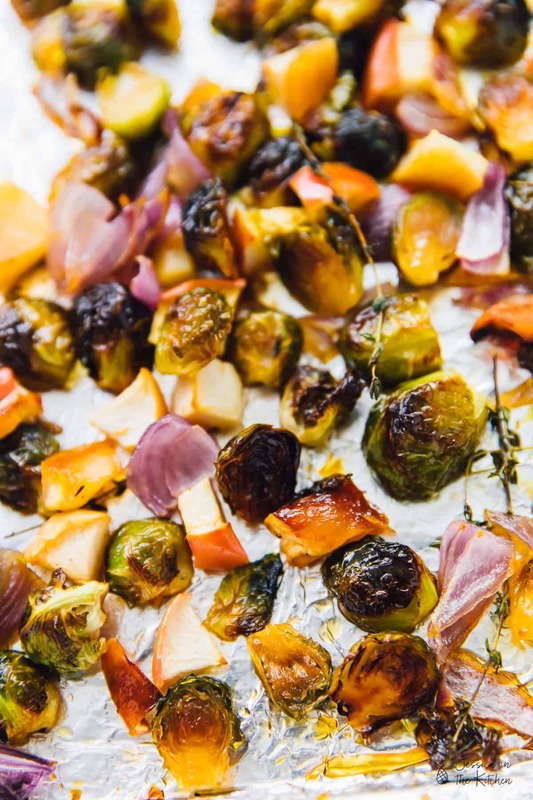 Add the brussels sprouts, onions and apples together onto a silpat lined or foil greased baking sheet. Mix the olive oil, maple syrup, salt and pepper together then drizzle over brussels sprouts mixture. Stir until everything is thoroughly coated (you can use your hands if you want). Turn all of the Brussels sprouts halves with the cut side down. This ensures that they get beautifully caramelised. Add some thyme sprigs to the baking sheets on top of or around the vegetables. 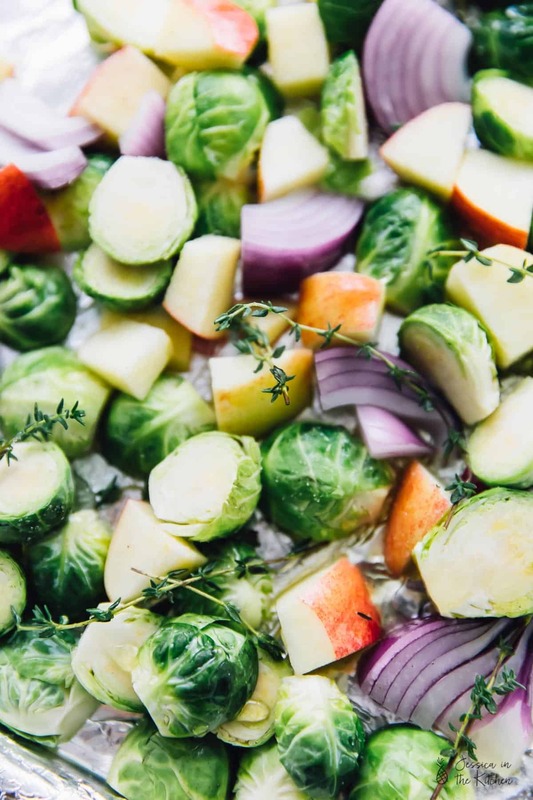 Bake for 35-40 minutes, shaking the pan a few times while baking, until apples are tender, onions soft and brussels sprouts begin to caramelise. You'll want to watch it around the 30 minute mark that it doesn't burn. Some of the Brussels sprouts skins may darken a lot, but they still taste delicious (and not burnt). Serve alongside caramelised pecans and soft vegan cheese (optional). Enjoy! Make these even better by adding in a vegan soft cheese with the pecans, after they come out of the oven. It adds a delicious brine that pairs perfectly with the sweet flavours. 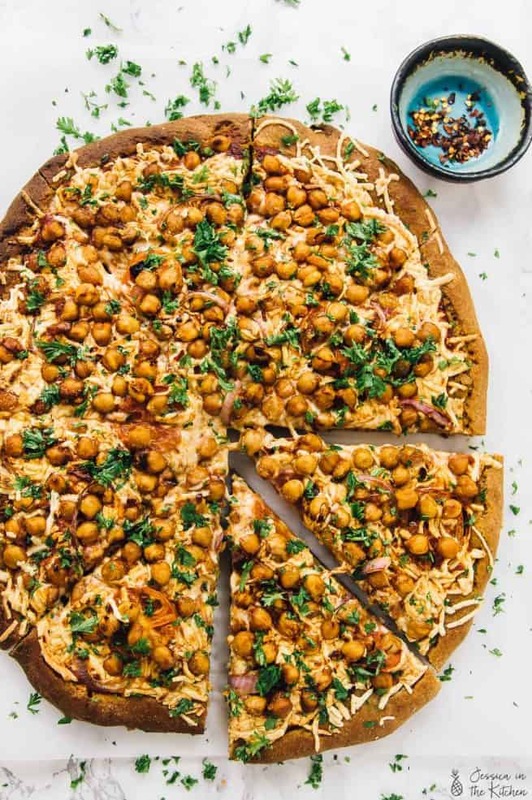 I loved using a vegan gouda flavour.